Communications between living things require that both parties interpret cues used to express their current disposition or overall mood. Since humans have no wagging tail, man's best friend must look elsewhere for signs as to how their master feels. On the other hand, humans must learn to recognize certain canine facial expressions to understand in detail what is going on, in addition to a favorable wag. Even though the facial structures of humans differ greatly, most dogs quickly learn to respond to visual clues seen on their owner's face. With direct links to the wolf, dogs use facial expressions like bared teeth to show aggression toward other animals as well as to posture when communicating with a human. Although bared teeth simply means the dog is showing its teeth, your interpretation should always air on the side of caution and submissive respect shown until other signs like vocalizations or tag wagging is assimilated. Body language like erect ears or tail could indicate a dog is asking you to step away and leave them alone. 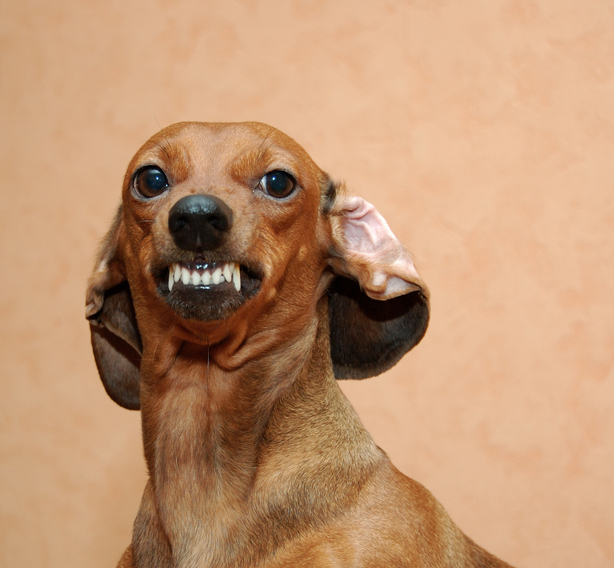 At times, a canine will bare teeth as a submissive grin or smile and with no intent of showing aggressive tendencies. Conversely, a recent study of an owner's facial features versus a stranger's concluded that dogs are very good at picking up on subtle cues but suggest these skills are acquired and not innate. However, many dogs have become quite adept at using the communication skills they were given. For example, your dog might tilt its head when you're speaking, which is a movement that demonstrates they are using their ears to assess the situation at hand. Dogs have about 100 different expressions and most are made with their ears. So, when you think your dog is listening to what you're saying, they are more likely focused on hearing how you're communicating the message. Moreover, dogs are aware that eye contact with a human signals a level of trust and comfort. If you have a recently adopted a rescue, you might notice the dog looking away to avoid eye contact. This is likely saying they want to avoid all interaction whether negative or not. Over time, these behaviors should morph into more positive affirmations.